Source: RCM. Bloomberg. Data from 1/1/2007-12/31/2016. 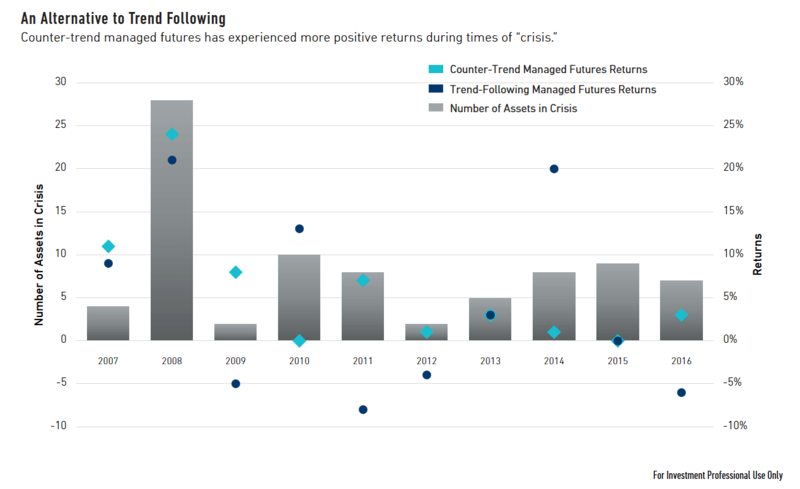 Counter-Trend Managed Futures is represented by a simple counter-trend system where models were applied to the S&P 500 Index, Russell 2000 Index, Nasdaq 100 Index, EURO STOXX 50 Index, German Stock Index, FTSE 100 Index, Nikkei 225 Index and KOSPI 200 Index. Each market was equally weighted monthly and no leverage is assumed. Returns are hypothetical, based on cash indexes and net of 2% annualized fees and expenses. Returns are excess of any cash return that could be attained on the collateral if implemented via index futures contracts. Trend-Following Managed Futures is represented by the SocGen Trend Index, which is designed to track the 10 largest (by AUM) trend following CTAs and be representative of the trend followers in the Managed Futures space. For a prospectus, or summary prospectus, that contains this and other information about the Funds, call 1-888-736-1227. Please read the prospectus or summary prospectus carefully before investing. The 361 Funds are distributed by IMST Distributors, LLC.